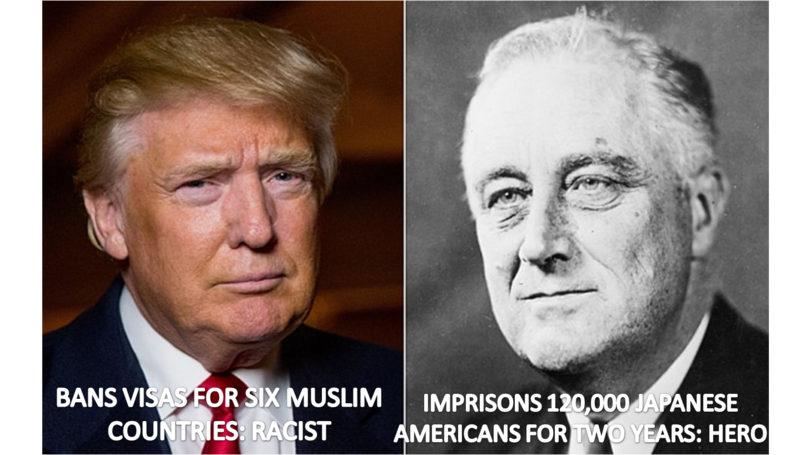 HomeDonald Trump or Franklin Delano Roosevelt, Who Is Worse on Immigration? Donald Trump or Franklin Delano Roosevelt, Who Is Worse on Immigration? I am in no way defending anything that Donald Trump is doing with his immigration ban. I am not a fan of Donald Trump, I did not vote for Donald Trump, and I think the man is a bad person. Imprisoned 120,000 Japanese American citizens, by executive order, for two and a half years, just because he felt they were a threat. Turned away 973 Jews on the St. Louis off the coast of Miami to their deaths in 1939. Refused to admit refugees from the Nazis into the US. Refused to even damage the death camp infrastructure during World War II allied bombing campaigns. Beyond that, he confiscated the gold of every single US citizen and arrested anyone who kept any gold illegally. He imprisoned people during the Great Depression for doing work inside their own homes in his crazy “spread the work” schemes. Donald Trump, on the other hand, has banned visas for a few hundred people from Yemen, Iran, Syria, and three other countries he doesn’t like that I don’t remember. I don’t think that’s good. But I have perspective. FDR is a beloved national hero, beloved by Jews especially, despite imprisoning hundreds of thousands of people by executive order and sending 973 Jews to their deaths. DJT is a racist Islamophobic scumbag for banning visas from Muslim countries. ← Is Hacksaw Ridge the Greatest Libertarian War Film Ever Made? I don’t think Franklin Roosevelt was a hero. He barely did anything in world war II and created barely any jobs for the American people. Joseph Stalin deserves most of the credit for the end of WWII. Even though he was an even worse person, he actually won the war, killed the Nazis, and freed the people in the Concentration Camps. Overall excellent blog. I enjoy my time reading it. One comment about this piece, which I particularly enjoyed, is regarding FDR and gold. He did confiscate everybody’s gold, but only on paper. An “executive order” so to speak that amounted to nothing more than lip service. And nobody got arrested. If I remember reading the history correctly, one guy turned in his gold, in the entire country! And he may have been only detained. There was no special prison or even a county jail for “gold criminals”. There was too much else going on.